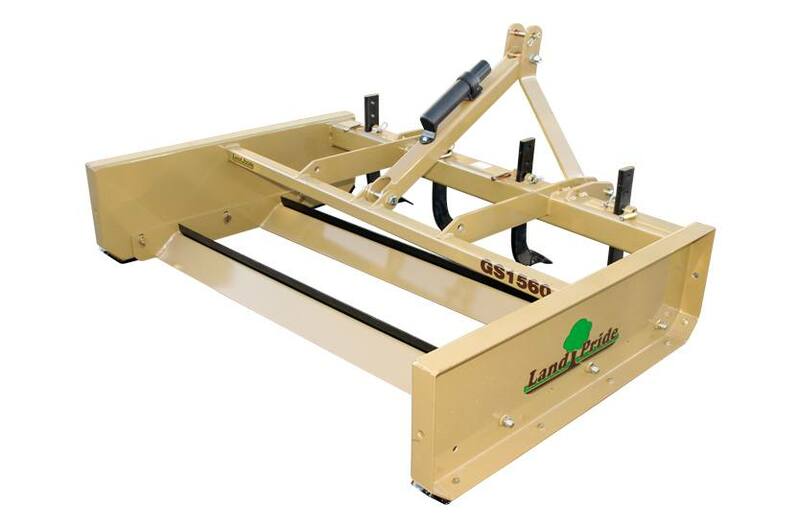 Simply setting a properly adjusted GS15 Series Grading Scraper on the ground and driving forward enables the operator to grade off high spots and fill in ruts and low spots on unimproved roads and lanes with little or no manipulation of the tractors 3-point hitch controls. Unlike a rear blade, they require no adjustment of blade angling or offset positions. The GS15 Series Grading Scraper simply and quickly moves dirt or aggregate from high spots to low spots. Overall Width: 78 1/4 in. Unit Weight with Shanks: 594 lbs. Side Panel Height: 14 in. Side Panel Length: 44 in. Side Panel Thickness Tractor: 3/16 in. Thick with 2 3/4 in. formed edges. Rear Beam Construction: 2 in.x 2 in.x 3/16 in. Heavy wall tubing. Skid Shoe Dimensions: 3/8 in. Thick x 2 3/4 in. wide x 44 in. long. Cutting Edge Placement: Two parallel grading blades positioned at a 5 degree grading angle with 17 1/2 in. fore and aft spacing in between leading edges. Shank Adjustments: 3 1/2 in. and 1 1/2 in. below grade level; 1/2 in. and 2 1/2 in. above grade level.